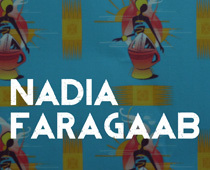 Nadia Faragaab is a Somali Australian artist. She juxtaposes the old and new. She says that often her inspiration comes the nuances of what it means to be Somali, to her no matter where the Somali is living in the world. The Blak Dot Gallery celebrates our exciting Anniversary Show: ONE. Commemorating the Gallery’s First Year of Operation. ONE is a dynamic composition of the Gallery’s supporting Artists, who not only have enabled the Gallery to enhance its presence in the community, but who’ve also distinctively created a hub of activity; which has ultimately reflected the Gallery’s sole purpose of creating and perpetuating a place for the presentation of the work of all Global cultures. Specifically, the innovative work of Australia’s own Contemporary Indigenous Artists. In addition to the fantastic Art on show, DJ MzRizk will be spinning the decks, making for the perfect atmosphere to enjoy yourself in the company of our wonderful people. The 18th Commemoration of the International Day of the World’s Indigenous People. The two events perfectly coincide, making for an excellent night to celebrate and enjoy the show!